This was another of my "getting ready for spring" sewing projects this year. Check out my zip hoodie and kids' art inspired t-shirt. Last fall I picked up a bunch of little summer dresses from the clearance rack for my little girl. $2 for a new dress? Yes, thank you. They are so cute and fun and colorful and will be perfect for summer. BUT, summer isn't here yet. Spring is (or should be, come on already!). And little summer dresses just aren't warm enough for the spring. They need a pair of cute leggings to go with! However, buying leggings at full price to go with each dress makes for not such a great deal after all. Fortunately I found something else on the clearance rack. T-Shirts! That's right. Not just any t-shirts either, bright, fun, extra large or extra-extra, or extra-extra-extra (you get the point) t-shirts for $1. Why is this so great? Because they're made out of knit! Nice stretchy wonderful knit! The bigger the shirt, the more fabric for your $. There is NO WAY I can buy that much knit at the fabric store for anywhere near that price! Bonus, if I use the hem already on the shirt it saves me time sewing. So, better price, less time sewing. 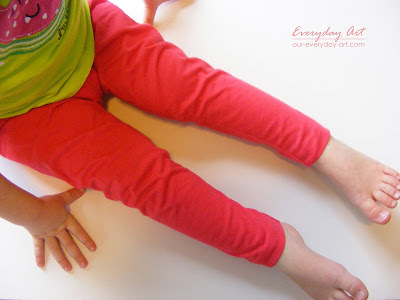 1- leggings need to stretch. Try to find a fabric with a good amount of stretch to it. Give it a tug, if it doesn't budge, use it for a t-shirt or skirt instead, but probably not leggings. I find that the best stretch is usually the women's shirts. Athletic shirts are often even stretchier. 2- direction matters. 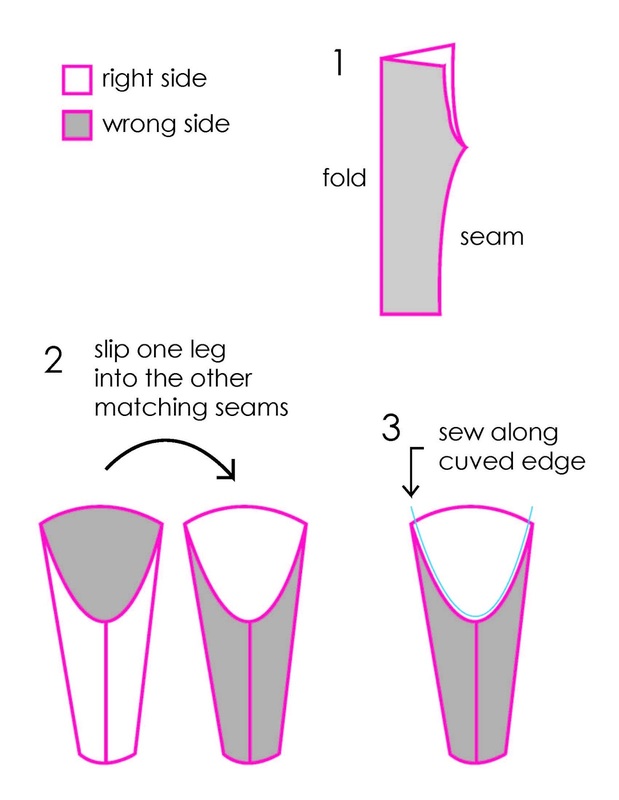 You might be tempted to turn your pattern pieces different directions to fit more on/get more out of your fabric, but don't. The stretch needs to go ACROSS the body, not up and down. This way the leggings stretch around. Start by using a pair of leggings you already have. 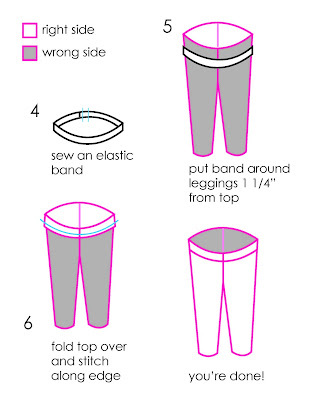 Fold the leggings in half so you can see the front. 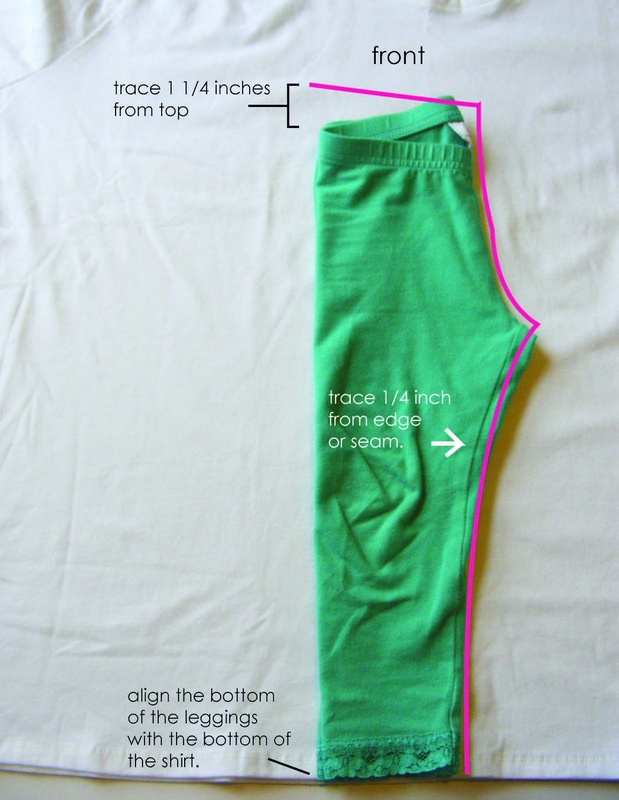 Lay them on the shirt (or a paper if you want to trace a pattern) with the bottom of the leggings aligned with the bottom of the shirt. Now trace 1/4 out from the inseam, all the way up to the waist band, up another 1 1/4 inches and across the top. 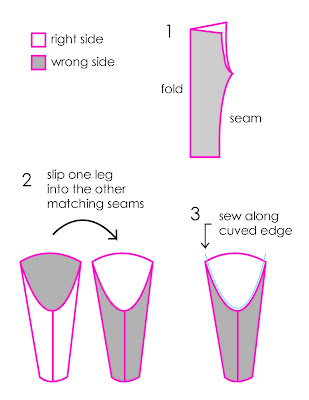 (Hopefully the picture helps) Tip *make sure on the inseam you are tracing 1/4 inch from the SEAM not the edge. The back is a little bit larger and sometimes still shows a bit when the leggings are folded. Another Tip *notice on the waist-line how the front of the pants dips lower than the back. If you are tracing the front, follow the angle of the front and if tracing the back, follow the angle of the back. You're ready to cut! 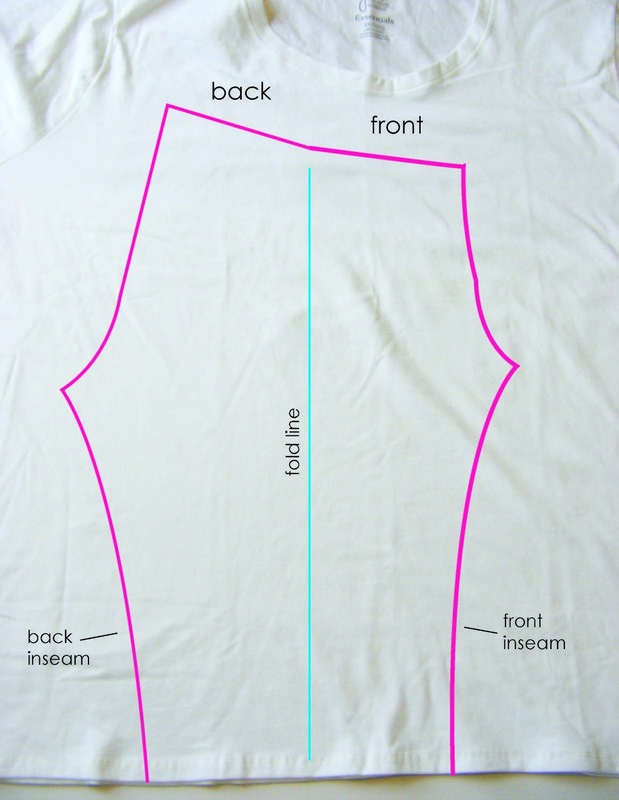 Cut through BOTH layers for fabric (the front and back of the shirt). This creates two mirror image pieces. DO NOT CUT ON THE FOLD LINE!!! 1.Fold one piece in half, with the right sides together. Line-up the inseams, pin, and sew a 1/4 inch seam. (I like to zig-zag stitch near my seam too.) Repeat this step for both legs. 2. Turn one leg right-side-out and slip it inside the other leg. Now the right sides should be together. Match up the seams and pin. *Do NOT sew across the top! Just along the 'U' shape, see the blue line? 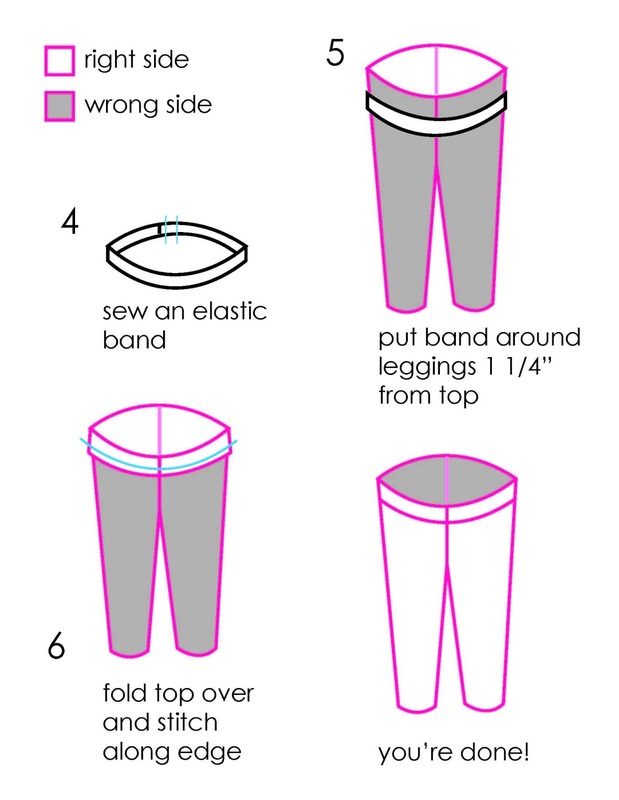 5.Put the elastic around the leggings 1 1/4 inches from the top. Make sure the leggings are inside-out! 6. Fold the top of the leggings over the elastic, pin in place, and stitch along the edge. 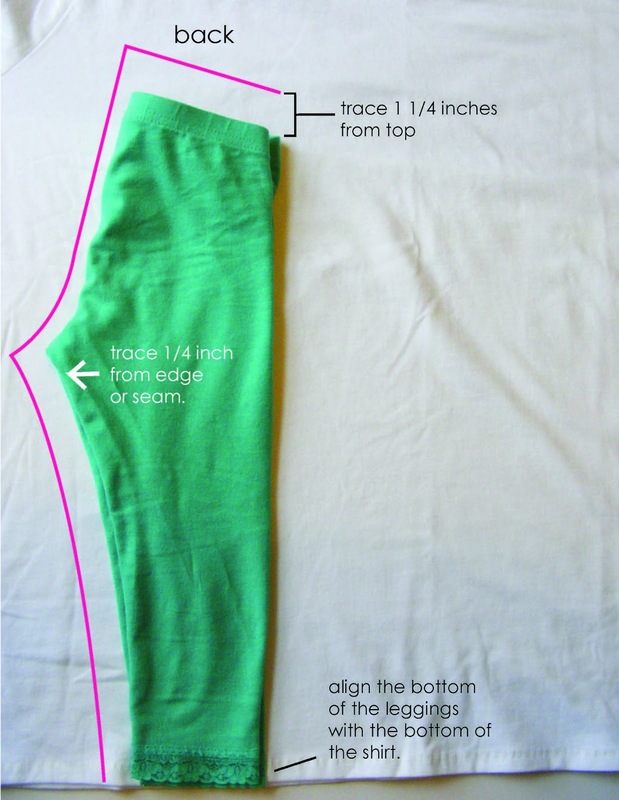 If your elastic is a little bit narrower than the leggings just make sure the fabric is evenly distributed all the way around and give it a little bit of a stretch as you sew so everything is laying flat and you don't end-up with tucks or bubbles. 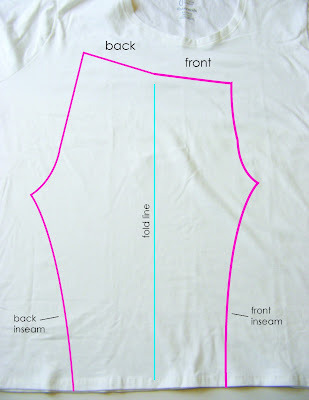 Also, *you want the waist band to be able to STRETCH, so use a stretch stitch or double needle for this step! Oh man! This could get me in trouble by knowing this! There are so many fabrics that I would love to turn into leggings! Oh my goodness, this is genius! I can't believe I never thought of it! My daughter loves leggings (like she would wear them every day winter and summer). I'm hitting every clearance rack I can find looking for oversized t-shirts. That'll save me a bundle on clothes! I'm pinning and sharing on my FB page! Brilliant! 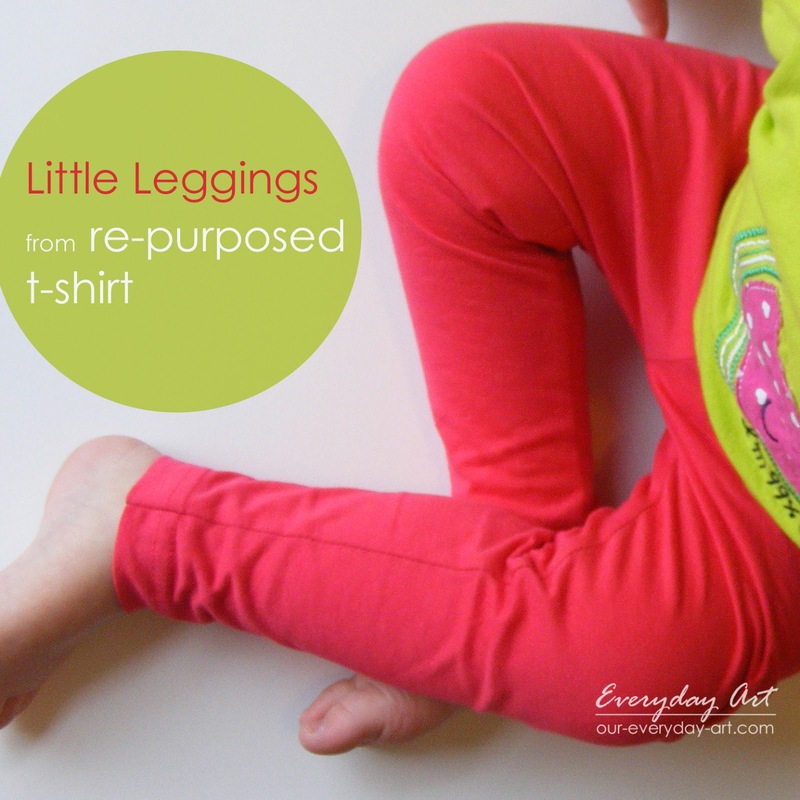 I love seeing what you ladies create - and these leggings are so perfect for my girls. Fantastic! So easy and so cute! Thanks for sharing it at Monday Funday!